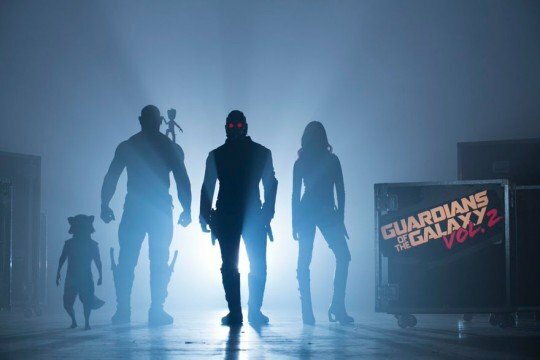 It’s still fairly early in the game for James Gunn’s Guardians of the Galaxy Vol. 2. The sequel is in the process of shooting in Atlanta, Georgia, and although this quirky entry in Marvel’s Cinematic Universe mostly takes place in the depths of outer space, one of the locations featured in the film looks to be very earth-bound indeed. In the first Guardians of the Galaxy, it’s revealed that Star-Lord (Chris Pratt) spent his formative years, before the abduction, in the fictional town of St. Charles, Missouri. For the sequel, Disney and Marvel have lovingly recreated St. Charles in Cartersville, Georgia for the shoot. Although it doesn’t appear that Peter Quill or his cohorts, Gamora (Zoe Saldana), Rocket Racoon (Bradley Cooper), Groot (Vin Diesel), or Drax (Dave Bautista) were on hand for the filming, some serious action took place in downtown Cartersville. In the video from the shoot, it appears as if the intergalactic fight has come to Terra. A crowd of extras scrambles out of the way of an unseen adversary, who’s upturning cars in his or her wake (likely added in post-production with the help of CGI). The small town streets are also lined with storefronts and signage which wink at Guardians’ screenwriters Dan Abnett and Andy Lanning, as well as comic book icon Jack Kirby. Hopefully, more of the mystery surrounding Star-Lord’s origins will unravel in St. Charles. And if the Milano and its crew are headed for Earth, we’ll likely come face to face with Quill’s father, played by Kurt Russell. Of course, without any main characters involved in the shoot, the action could just be part of a memory seen via flashback. Whether or not Guardians of the Galaxy Vol. 2 swings by the planet for a moment or a visit, the film is still shaping up to be another exciting interstellar romp for our favorite band of heroes.